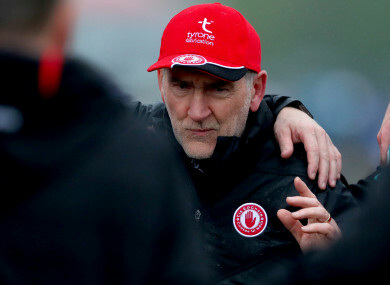 Mickey Harte has been in charge of the Tyrone footballers since 2003 and has won three All Ireland titles with the county. TYRONE LEGEND OWEN Mulligan has labelled Mickey Harte’s decision to start three ‘injured’ players as ‘criminal’ in their two point defeat to Monaghan on Sunday. Mulligan emphasised the ruthlessness of Harte in his team selection and substitutions during the game, criticising the Tyrone manager’s early substitution of Ronan O’Neill and their league form. Tyrone’s loss ends their Ulster three-in-a-row hopes as they enter the qualifier draw along with big names such as Mayo and Cavan. Harte started half-back Tiernan McCann, midfielder Colm Cavanagh and corner-forward Lee Brennan despite injury concerns in the lead up to the crucial Ulster SFC quarter-final. “What was criminal from Harte was that he started three injured players – Cavanagh, Brennan and McCann. None of them made an impact and they were taken off early. “When you’re playing a quality side at this intensity you can’t expect to carry anyone with an injury. Surely Harte knows this? It gave Monaghan that bit more confidence to see these lads come off,” Mulligan told Paddy Power News. Ronan O’Neill was also substituted early in the first half and the former Tyrone forward said he sympathises with O’Neill but isn’t surprised by Harte’s decision. “We all know Mickey Harte is ruthless, and I know it better than anyone. He really doesn’t care who you are, if you’re not performing, you’re off. “Ronan’s an Omagh man and that’s his home ground which would sting him even more. I thought it showed a lack of respect to him if I’m honest. “It looked ridiculous when he threw the gloves. Harte won’t take actions like that lightly, but at the same time he won’t care. It happened to me in my first year at senior, it was a f**king nightmare before Mickey came in,” he continued. Mulligan praised Monaghan’s effective game plan and claimed that goalkeeper Rory Beggan and Conor McManus are ‘matchwinners’. The three-time All Ireland winner felt that although Tyrone were fit and sharp but their defensive shape was almost completely out of place and that Harte’s side have failed to recover from their defeat to Dublin in last year’s All Ireland semi-final. “For me I thought Tyrone were papering over the cracks during the league, at the end of the day they lost their first couple of games and just about managed to stay up. I thought Monaghan were brilliant. “It could’ve gone the other way but the big players stood up for Monaghan, the likes of Beggan and McManus were unbelievable, total match winners. You need your big players to step up and ours didn’t. “I was actually very impressed with Tyrone, they looked fit and leaner than ever before. I thought Morgan’s kick outs were excellent and he made great saves. But he just has a habit of being rash and hitting out when things aren’t going his way which really doesn’t help the side. “I thought that our defenders looked very flatfooted. We normally have a solid footing there. The forwards didn’t track back as much and Monaghan’s backs were running into acres of space. “They made Vinny Corey look like a bloody All-Star! 1-1, who was marking him?! They just kept breaking through with something that would have never worked against us for the past couple of years. “I was wild impressed with Monaghan, I thought O’Rourke got it spot on. His man management looks to be outstanding and everything he did turned to gold. Email “Owen Mulligan: 'What was criminal from Harte was that he started three injured players'”. Feedback on “Owen Mulligan: 'What was criminal from Harte was that he started three injured players'”.